There's something romantic about hacking the iPhone, especially when it means finding ways to personalize the massively popular handset. Apps like Instagram may help you realize artistic talent, but software just doesn't get those creative juices flowing like an old-fashioned piece of hardware can. Despite its taboo-sounding name, The Love Box isn't an adult toy in the traditional sense, instead serving as an analog video (and stills) mixer for your iPhone 4 or 4S. 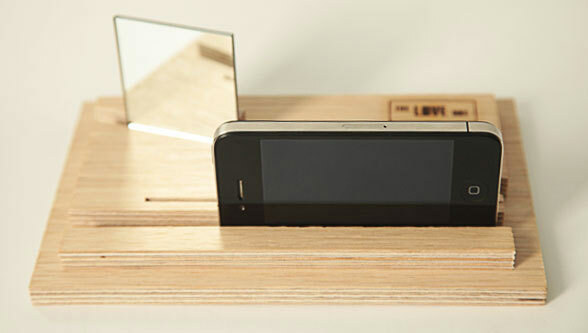 Consisting of a wooden box and an angled sliding mirror, the homegrown contraption lets you simultaneously capture the action in front of and behind you in a single image. It was originally designed in Barcelona to capture two people conversing for a documentary called "The Love Box Conversations," hence the name. The "lowest-tech accessory for the highest-tech phone" is available now as part of a very limited initial run of 100 units, and can be yours for €57.63 (about $77.50) if you hit up the source link below. The Love Box is an analog video mixer, house of mirrors for your iPhone (video) originally appeared on Engadget on Fri, 27 Jan 2012 13:39:00 EDT. Please see our terms for use of feeds.